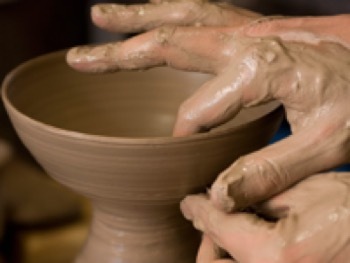 Perhaps no analogy best exemplifies the spirit of submission as the molding of clay under the hands of the potter. In this paper, the teaching and practice of submission in the life and ministry of Jesus will be discussed. Submission will encompass several other names: obedience, subordination, allegiance, reverence, trust and self-denial. Submission is at the heart of discipleship. It acknowledges the lordship of Jesus over every aspect of life. The concept of submission involves relinquishing one’s individual rights in favor of another. It is only through complete submission that a follower of Jesus is able to open one’s heart so the Holy Spirit may be received and dwell in it. Partial submission is not an option for one who calls Jesus Lord. Upon reading this paper, I hope the reader walks away knowing that total submission is indispensable to the Christian walk. The gift to be transformed from within is from God, as He gives the believer a new heart. But the practice of the spiritual discipline of submission puts the believer on the path of making it possible to receive that gift. Submission is not something obtained when someone becomes a Christian or a disciple of Jesus but a lifelong practice that paves the way for the transformation of the individual who is being changed from within-- from mere dust to a useful vessel under the hands of the Creator. As a spiritual discipline, Thomas à Kempis (1955) defines submission as follows: “…but if we desire that God be among us, we must sometimes set aside our own will (though it seem good) so that we may have love and peace with others” (p.40). Submission is servanthood. Submission is self-denial. It is obedience and disregard of one’s own will in favor of another with the goal of establishing peace. It is the pledge of allegiance to someone else. It is the essence of discipleship to Jesus Christ. "An old habit is not easily broken, and no man will readily be moved from his own will; but if you cling more to your own will or to your own reason than to the humble obedience of Jesus Christ, it will be long before you are a man illumined by grace" (p. 48). "I made Myself the humblest and lowest of all men, so that you would learn to overcome your pride through My humility. Learn, therefore, you who are but ashes, to be humble for my sake; learn to break your own will and to be subject to all from the heart” (p.124). From creation, God has laid before man the choice of submission—obedience or disobedience. From the story of Adam and Eve to the nascent nation of Israel, submission has been presented as a choice between life and death. From patriarchs to judges, kings to prophets, we see people called by God to submission. "Very truly I tell you, unless a kernel of wheat falls to the ground and dies, it remains only a single seed. But if it dies, it produces many seeds. Anyone who loves their life will lose it, while anyone who hates their life in this world will keep it for eternal life. Whoever serves me must follow me; and where I am, my servant also will be. My Father will honor the one who serves me." Submission is at the heart of discipleship to Jesus. Beyond teaching about obedience, Jesus’ lifestyle was one of submission and obedience. "The person who enlisted in His cause, He taught, would need to deny himself (34), i.e. abandon the attitude of self-centeredness, and take up his cross, i.e. be prepared to face martyrdom, …. He would have thus to be willing to lose his mortal life; and all this, for Christ’s sake and for the gospel (35), i.e. for the sake of spreading abroad the good news of the kingdom of God; for only in this way would he attain the true life, that of the age to come" (p. 1167). John 1:30-John the Baptist makes way for Jesus and acknowledges Him as the Messiah spoken of by the prophets and awaited for by Israel. Rather than keeping his band of followers, John the Baptist points them in Jesus’ direction. Mark 14:36-Jesus surrenders to God’s plan for His death and crucifixion. Luke 23:46-Jesus surrenders His spirit to God on the cross. It seems odd to pick the parable of the prodigal son to talk about submission, but the story has elements that highlight a lack of it—self-centeredness, a lack of regard for others, irreverence towards authority and allegiance to one’s interests alone. Yet in the end, the story highlights the transformation which God is able to perform on the heart of one who takes the path of submission. Jewish culture considered, "honoring your father and mother," a command of utmost importance. The beginning of the parable sees this command violated as the younger son asks for his portion of the inheritance. Moreover, Jesus’ audience was shaken from its cultural view of the younger son being the rightful heir (think: Isaac over Ishmael, Jacob over Esau, David and Joseph over their older brothers). By highlighting the profligate ways of the younger son, Jesus’ audience is being asked to change their way of thinking. As the younger son wastes away his inheritance, he reaches a point where his choice lands between starvation and going back to his father’s home, albeit in a different capacity. His internal dialogue in vv. 17-19 shows that, while his previous actions may have been to cut off his family ties (vv. 12-13), in his time of need, he recognizes that he is still his father’s son (emphasizing the father-son relationship in vv. 17-19). 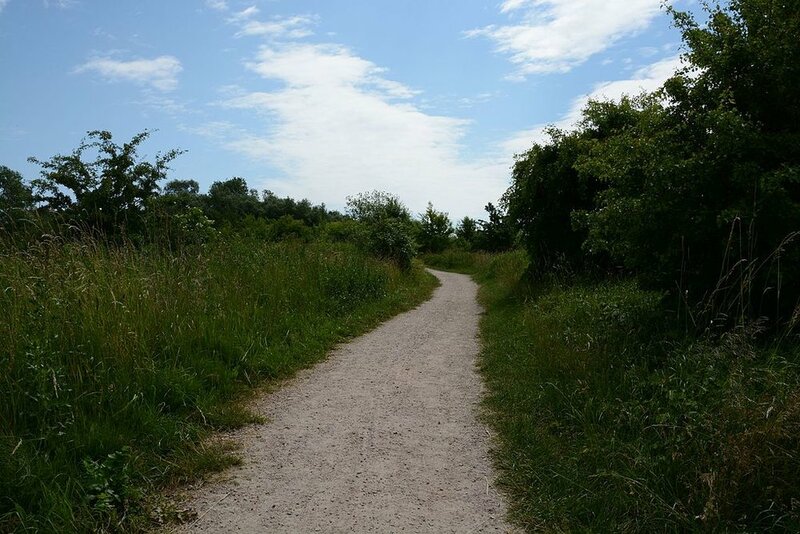 On his return journey, the son takes the path that would bring him home to his father. The younger son recognizes the condition by which he must present himself before his father—unworthy, capable only of being a hired servant, a sinner who has dishonored and severed his allegiance to his family. On this same path, the father meets the son and restores his position, regardless of how unworthy the son may be. This story teaches us about the path—how the practice of the spiritual discipline of submission paves the way for God to meet us where we are transformed, not by anything we do but by how the Father treats us. “It’s not the disciplines themselves but God at work through them that enables us to love him and love our neighbor more and more” (Johnson, 2017, p.79). In the practice of spiritual disciplines today, we ought to develop an awareness of our own unworthiness as we make our way back to God. We are sinners, servants who can only do our jobs. Yet in practicing submission and obedience, God meets us along the way and transforms us—from how we view ourselves to how He views us—as children who belong in His family, worthy of the fattened calf, of restoration to His family, regardless of how we may have mistreated Him in the past. In God’s story, the reconciliation facilitates the transformation. It is a story of the prodigal father more than that of the prodigal son. It expresses the lavish, extravagant scale by which God loves us—unconditionally—the gift we receive for the price of our submission. The practice of spiritual disciplines is merely a path. On the journey to be reconciled to God, the practice of submission puts us on that path. Submission is the physical manifestation of denying oneself, not giving in to our pride, not promoting self-reliance, but rather allowing submission to nurture hearts that would be open to being transformed into hearts of humility. Submission allows us to take the journey back to God, to acknowledge our decisions’ shortcomings when we choose to live away from God’s family, and, recognizing our inherent need for God, to belong to His family; and that a life outside the family of God leads to spiritual starvation and death. expressing a deep regard for others and what they might have to offer (p. 118). In the discipline of submission lies a heart of trust, obedience, self-denial, allegiance, subordination and reverence for the One who desires to reconcile all to His family. The parable highlights the heart that God has displayed to His chosen people from the beginning—His prodigal love for Israel as He brings them out of Egypt, His prodigal promise to Abraham in Genesis 12:1-3, His prodigal love to all nations as He sends His only Son, making reconciliation possible. It teaches that God will meet us halfway, if not more, when we submit and take the path back to be reconciled to Him. In the story of the prodigal son, I find myself as the younger son, concerned about myself and how I’m going to survive, how I’m going to live, and going back to my father so he can provide for me. Like the younger son, even when I have tried to walk the path back to God, it is because I recognize that I need Him for how he can provide for my wellbeing. What I fail to see is the extravagance of the father’s love as I have continued to love myself and looked to God to take care of me. In St. John of the Cross’ spiritual direction, it is the internal purity of the soul—the destruction of all self-love for the love of God above all—rather than the externals of life’s action that are of paramount importance. As I strive to get rid of all self-love in my heart and submit all of my self, relinquish all my desires and align my will to that of God’s for my life, I am reminded of similar vows I made to my husband when we got married—that all my thoughts, love and desires have been pledged to him in this life. Comparing this allegiance to my marriage, my acknowledgement of Jesus’ lordship in my life demands that all my desires, all my love be submitted to Jesus as well. The parable of the prodigal son reminds me of my shortcomings in my understanding of the greatest commandment: to love the Lord with all my heart, mind, soul and strength. Like the younger son, I have walked this path. I had pledged my allegiance to God and made Jesus Lord of my life. At some point in my discipleship, I decided to walk away from the Father. Living an immoral life where I took control of my choices rather than choosing to be obedient to God and continuing to be a part of His family, I made my way back to the world with the illusion of having the freedom to make my own choices. Along the way, I broke relationships, dishonored my pledge, severed my ties with God’s family. It was months later when I finally broke down and realized how empty my pursuit has been. I found myself with nowhere to turn except back to God. The heart of the younger son in vv. 17-19 resonated with me. I resolved to go back with the heart that I had nothing to offer God but my sinful life and my broken heart. I would ask him to take me back and face whatever consequences came my way. It has been over 20 years since He took me back. I have been welcomed with the fattened calf, I have partaken of the great banquet and been restored to the family of God. Truly God is gracious: he took my sinful life and made it beautiful. He took my broken heart and made it whole. The privileges I enjoy now, being married to a son of God, having a family of my own, the gift of purity in our relationship, are expressions of the extravagance of God’s love for me. I had nothing to do with it. I only made the decision to take the path back to God—with a heart that was willing to submit and obey. Submission has not been an easy path for me. A single mother in a matriarchal family raised me. When I became a disciple of Jesus, my lack of submission showed in the way I treated authority, especially male authority. This weakness showed in my relationships. I justified my lack of submission with scriptures like Ephesians 5:21, “Submit to one another out of reverence for Christ,” or with other religious-sounding arguments or twisting of the Scriptures’ meanings. Over the years, I have studied, sought advice and practiced what I thought were ways that helped me develop a more submissive spirit. The study of spiritual disciplines has shown me that I have quite a way to go on this path. As I have grown older, I have come to rely on outward practices rather than dealing with my heart. I have been content with outward expressions of submission rather than true reverent piety towards God. As I reflect on my life, I look back on the innumerable times God has continued to open His arms and welcome me back when I have strayed from submission. being an eager learner, trainable and tractable (p. 118). "Godly submission is rooted in God’s good and loving intentions for each one of us. … Therefore, biblical submission does not … rob them of their freedom. Submission is a way we allow God’s kingdom agenda to shape our choices, relationships and vocations. And it always works in conjunction with personal freedom" (Calhoun, 2005, p. 119). Corporally, we could emphasize imitating Jesus individually more rather than organizing activities that only serve to make us look like every church in our community. In practicing submission, our congregation could nurture relationships in the family of God that would promote healthy guidance in our “one-another relationships.” Our emphasis on external, corporate activities tends to drive the individual away from practicing spiritual disciplines as we lack the time and direction to develop them personally. We are part of an increasingly-connected global environment. Every moment of our lives can be documented or filled with entertainment at the touch of a fingertip. Peace comes at a premium as people tend to want to go to far-flung places, secluded and away from all that civilized life offers in order to find a break from the pace of their lives. Living in a society that moves at such a frenetic pace, the parable of the prodigal son offers the world the peace that counters the prevailing culture—freedom through submission, victory in surrender, a full life if you relinquish everything. To help us reach the world for Christianity, I believe the story of the prodigal son helps us understand that reconciliation with God is not dependent on our transformation of ourselves. There is nothing we can do on our own to facilitate the transformation of our hearts. It would be exhausting work if it was left up to us. A heavy yoke versus Jesus’ easy yoke. In the same way, sharing with others about God is not about what people ought to ‘do’ in order to be reconciled to God. Rather, we ought to teach of the most important decision that the younger son has taken—that of walking the path that would take him home to his father. God will do the rest. In pottery-making, kneading is a very important first step. After taking clay, water is added to it. Water is distributed evenly but if the clay is really hard, it needs to be soaked in water. Only after this step does the clay become moldable. Likewise, it is only after the believer is immersed in the waters of baptism is one’s heart ready to be transformed by God. The next step is molding. When a potter makes something, you learn to love everything about the finished product. You love it because you made it—every curve, every contour, every shape, every imperfection. In this way, God already loves us even as He makes us into His finished product—every shape, every imperfection is lovingly formed. Working with clay also produces the best result when one works daily. Working on it inconsistently would return the clay to its harder form thus requiring more effort from the potter next time. So it is that the spiritual practice of submission aims for consistency. In molding, the pressure needs to be even AND gentle—not too soft, not too strong. The good potter knows that the pressure on the inside of the clay vessel needs to be the same as the pressure on the outside. At times, we may feel hard-pressed but God knows how much pressure to put—inside and outside—as He molds us for His use. Once it has taken the shape that the potter intended, the pottery is now put through the heating process. The heating process allows the clay particles to stick together. At the end of the first heating process, the pottery is not ready for use yet. It’s formed but brittle. One could compare it to our younger years of discipleship as God gently forms us and molds us. In order to be useful, it has to go through another heating process that requires more heat. The temperature required during the heating process depends on the purpose or intention of the potter for the vessel. The times in our lives when we feel the most ‘heat’—of suffering, persecution, we are being molded according to God’s purpose for our lives. Finally, the potter applies glaze to the pottery. Glaze is not inherent in clay. It can only come from the artist. This is the grace we receive from God. It is Jesus’ blood, the sacrifice of His life that covers us so we are reconciled with God. It is not something we can do on our own; it can only come from the Father. 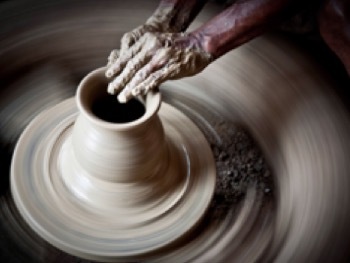 When the potter is done, the original clay is no longer visible—only the glaze. So it is with our lives, when God, the potter, is done molding us and transforming us, it ought to be Jesus who is on display. À Kempis, Thomas. (1989). The Imitation of Christ. Gardiner, Harold S.J. (Ed.) New York, NY: Image. Bock, Darrell. (1996). Luke, Vol. 2, Baker Exegetical Commentary on the New Testament. Silva, Moisés (Ed.). Grand Rapids, MI: Baker Books. Bonhoeffer, Dietrich. (1995). The Cost of Discipleship. (Munchen, Verlag & Fuller, R.H., Trans) New York, NY: Touchstone. Original work published 1937. Bruce, F.F., gen. ed. (1986). The International Bible Commentary with the NIV. Grand Rapids, MI: Zondervan. Calhoun, Adele Ahlberg. (2005). Spiritual Disciplines Handbook: Practices That Transform Us. Downers Grove, IL: IVP. Easton, Burton Scott. (1926). The Gospel According to St. Luke: A Critical and Exegetical Commentary. New York, NY: Charles Scribner’s Sons. Eerdmans Bible Commentary Third Edition. (1987). Grand Rapids, MI: WM B Eerdmans Publishing Co.
Ferguson, Gordon. (1995). The Victory of Surrender. Woburn, MA: DPI. Foster, Richard & Griffin, Emilie, ed. (2000) Spiritual Classics. San Francisco, CA: HarperSanFrancisco. Foster, Richard J. (1988). Celebration of Discipline: The Path to Spiritual Growth (2nd ed.). San Francisco, CA: HarperSanFrancisco. Johnson, K.D. (2017). Practices of Love: Spiritual Disciplines for the Life of the World. Christianity Today, 61(7), 77-79. Kinnard, Steve G. (2006). The Way of the Heart: Spiritual Living in a Legalistic World. Newton, MA: IPI. Kozlowski, Joseph Paul. (1998) Spiritual Direction & Spiritual Disciplines. Goleta, CA: Queenship Publishing. Levine, A. (2014). A parable and its baggage: what the prodigal son story doesn’t mean. The Christian Century, 131(18), 20-23. Powell, John S.J. (1978). Unconditional Love. Allen, TX: Argus Communications. Rolheiser, Ronald. (2014). Sacred Fire: A Vision for a Deeper Human and Christian Maturity. New York, NY: Image. Tobkin, M.J. (1998). The tension between justice and mercy in the parable of the prodigal son. Journal Of Theta Alpha Kappa, 22(2), 26-43. Lives. New York, NY: HarperOne. Williams, B.J. (2010. Brotherhood motifs in the parable of the prodigal son. Restoration Quarterly, 56(2), 99-109. Christian Leaders of the Seventeenth Century. Westchester, IL: Crossway. I was baptized in the US territory of Guam 24 years ago. 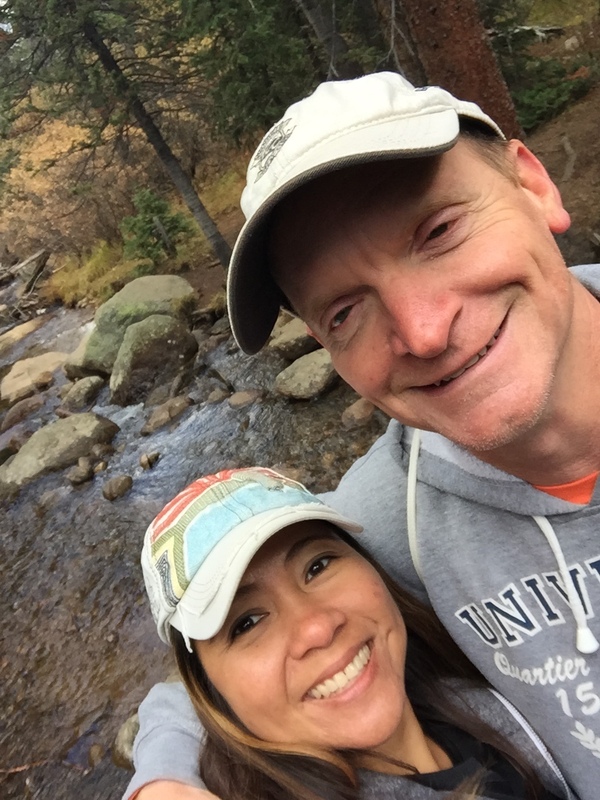 After moving to Denver from four wonderful years in Cambodia, I started pursuing my MABT in the Rocky Mountain School of Ministry and Theology. I recently transferred to Lincoln Christian University and hope to pursue a MA in Biblical Languages as well. My husband and I currently serve in our youth and family ministry and we hope to use what we are learning to serve in smaller churches in the future. "Let Each One Be Careful How He Builds"